Some folks in life just seem to draw good fortune and lucky breaks to them like waves on a shore, while others seem to be tossed about in the currents of outrageous fortune, bobbing up to barely catch a breath before being pulled under once again. If you know someone currently getting knocked down by one wave of misfortune after another, snapdragons are the perfect flower to encourage them to get up again, while letting them know that there are people on the shore cheering them onward. Few things in life are as discouraging as a series of unfortunate events, but a well timed gift of flowers from someone who recognizes your struggle and wants the best for you are a lifeboat in a tempest. 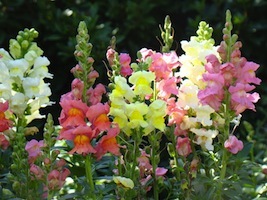 Snapdragons are said to symbolize graciousness, strength and forbearance in the language of flowers. While an annual, meant to survive only one season, this flower is able to withstand both the blazing heat of the summer sun and the chilly nights of early fall at altitude. 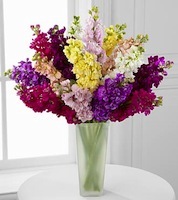 As a cut flower, the snapdragon adds both length and lushness to an arrangement in a vase and hold up beautifully as a bouquet. Colors range from deep scarlet to a pastel pink or golden yellow, with many colors showing more than one hue in each individual bloom that lines the stem. Hardier than they look, snapdragons will last for a week or more in a vase with clean water and are, at times, undervalued- costly only around a dollar per stem, though they are certainly worth much more. 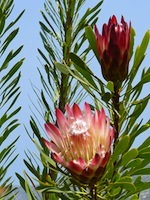 Tall and regal, this flower can reach a height of between 2 and 3 feet. The individual flowers are shaped somewhat like the head and face of a dragon and appear to open up their mouths when squeezed from the side, hence the name “snapdragon.” Each of these flowers surround the stem, opening up from the bottom to the top. Both fierce and lovely, this flower will remind the receiver to hold their head high and be brave through whatever storm life may send them. Native to the New World, the snapdragon looks great mixed in with other wildflower such as solidago, eryngium or any of the asters or daisies. For a softer look, consider the delicate lisianthus along with some wispy curly willow. Help someone who finds themselves in a sea of trouble with the sturdy snapdragon. You’ll be surprised what a few flowers can do at just the right time.